The Dork Tower gang as you've never seen them before -- in 3D! In the Dork Tower Miniatures set you get Ken as a cleric, Matt as an archer, Kayleigh as a knight, Igor as an armored Munchkin . . . er, warrior, Gilly as a seductive sorceress, and Carson as a hairy-footed rogue. One look, and you'll know what Igor means when he says, "It must be mine!" 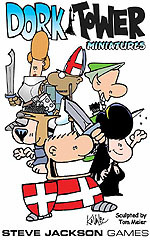 Use your Dork Tower Miniatures to play Dork Tower, Chez Dork, and Dork Frag.